Your mind can be your best friend, but it can also be your biggest enemy. 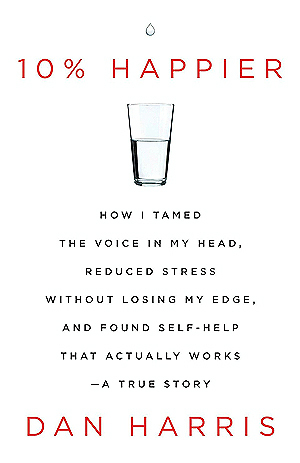 It is not easy to tame the negative voice inside your head that keeps you from being truly happy, but it is possible. 10% Happier is the true story of a man who discovered how to cross the barriers keeping him from achieving happiness. It also promises to help you become 10 percent happier—this may not seem like a lot, but it is. We have analyzed the book and compiled a list of actionable items from it that will help you become 10 percent happier, as well as increase your level of success and productivity. Most of these actions revolve around the theme of “mindfulness,” which is a simple concept that describes the quality of being aware of both yourself and your surroundings in the present moment. By implementing even one or two of the actions below into your daily routine, you will notice a marked increase in your happiness. Dan Harris is the coanchor of Nightline and the weekend editions of Good Morning America. He regularly reports for 20/20, World News with Diane Sawyer and the weekday editions of Good Morning America. Before joining ABC News fourteen years ago, he worked for local news outlets in Boston and Maine. "10% Happier" is his first book. Understand that your worrisome thoughts have no concrete reality to back them up. Accept your life for what it is. Extend compassion to those around you.